APR 16 (WTN) - If everything is accordance with the estimates so the coming time is going to be quite spectacular for the Indian economy, and the boom can see there. We are saying this because if the prediction of the Indian Meteorological Department is believed, then the monsoon rains will be normal this year. If this remains the same, then it will be good for the agriculture production and the economy of the country will get much strength. For your information, let you know that the Indian agriculture is largely dependent on monsoon rain. Nearly half of the country's land is dependent on monsoon rain for irrigation. According to the information received from the Meteorological Department, monsoon rainfall is expected to be 96 per cent in the long term this year. Significantly, the weather department defines the rainfall between 96% and 104% as the average or normal monsoon. If we look at the rainfall data of the past years, so the rainfall was recorded 95 per cent in 2017 and 91 per cent in the year 2018. That is, the rainfall was less than usual in both of these years. But this year, the distribution of rainfall in the country during the monsoon season in 2019 is going to be very good, which will be beneficial to the farmers in the Kharif Season. For your information, let you know that monsoon rains are of great significance for the Indian economy. Monsoon rains are crucial for the estimated 2.6 billion crores of agriculture-based economy as well as remaining economies of India, with an It is obvious that due to the normal monsoon, the crop of Kharif Season remains good, and due to good yield, the income of the people in the rural areas increases. 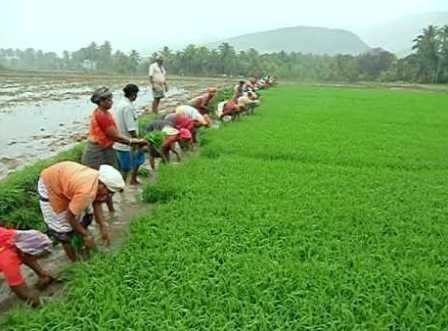 With good yields, due to the increase in the income of the people engaged in the cultivation of farming including farmers, in the rural areas, their purchasing power increases, due to which sales of other products including automobiles and electronic items of household uses fiercely increased. In such a situation, there is a huge demand for automobile, electronics, garment and other sectors products, due to which the economy gets accelerated. Not only this, due to good monsoon if the yield is good. Then inflation remains under control. When inflation remains under control, the Reserve Bank is also obliged to cut interest rates keeping in view all the circumstances. However, after the good yield, the prices of crops are low, which leads to anger in the farmers. But still due to the normal monsoon, there is a boom in the economy. According to the experts of the agricultural economy, with good monsoon rains, production of crops such as soybean, sugarcane, cotton, maize and rice will be good. With good production, farmers will get money and their purchasing power will increase. By increasing purchasing power, the farmer will turn towards the market, which will naturally strengthen the economy. It can be said that the normal monsoon signs clearly that the coming days are quite good for the country's economy. After the announcement of the normal monsoon; automobile, electronics, garment and other sector-related companies will increase their production, this is because normal monsoon will contribute in the good crops after which the income of the farmers will increase and they will turn to the market for the purchase. That is, the news of the forecast of the normal monsoon brought relief to the farmers as well as industries.